Being an ISO certified company, we have designed and developed the most competitive range of the Industrial pinch valves to cater vast field of industries. 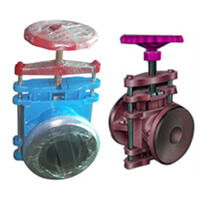 to cover up the dissimilar area of products, we offer appropriate range of pinch valves. we offer different sleeve materials for the varied applications. We offer varied sleeve options for the sleeve materials like natural, neoprene, butyle, nytrile, hypelone, E.P.D.M, silicone and viton.